Note: The audio at the beginning isn’t perfect. It’s a lot better about ten minutes in. 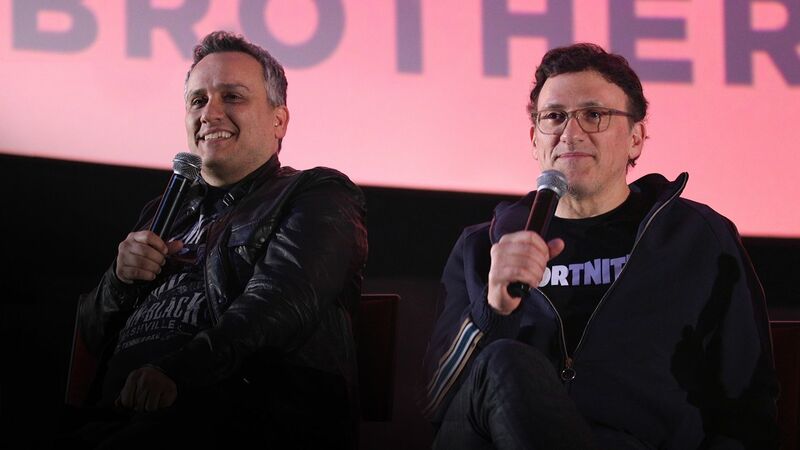 A few nights ago, I got to do something incredibly cool: I moderated an epic two-hour Q&A with Joe and Anthony Russo following a special screening of Avengers: Infinity War in Hollywood. Since we promoted the exclusive event non-stop for over a week, I think a lot of you knew about it. But if you didn’t, Collider partnered up with ArcLight Cinemas for a free screening of the film at the Cinerama Dome for 850 fans, and we even had Sideshow giving away some awesome collectibles to the people in attendance. In addition, Sideshow brought the brand new, not yet released, Infinity Gauntlet by Hot Toys and we had it on stage between me and the Russo Brothers. You’ll see it in the video. It’s awesome. Since we had over eight thousand people asking for tickets to attend the exclusive event, and plenty of people from around the world asking to see the Q&A, we made sure to film the entire conversation with multiple cameras. While the beginning is me asking some fun questions about Star Wars, the Fox/Marvel deal, and what fans need to do to get them to helm a Wolverine/Spider-Man team-up movie with Hugh Jackman, after that, we dove into Infinity War spoilers and I asked a lot of in-depth questions about the making of the Marvel epic. 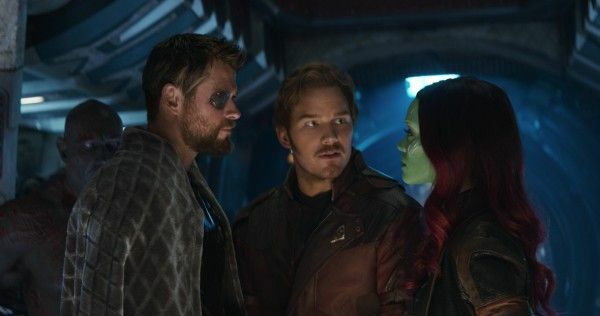 Some of the topics we discussed were if Thor’s new hammer Stormbreaker is more powerful than the Infinity Gauntlet, deleted scenes, how they landed directing Infinity War and Avengers 4, who came up with Chris Pratt trying to imitate Thor’s (Chris Hemsworth) voice, if Thanos was only able to beat Hulk because he had the Power Stone, where Hulk was just before film starts, and so much more. 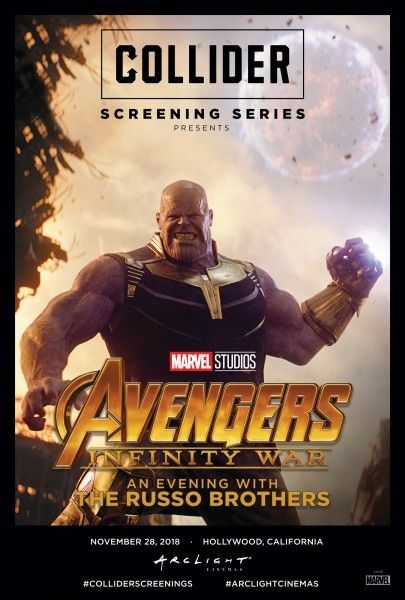 If you’re a fan of Marvel, the Russo brothers, and one of the best films of the year, I’m extremely confident you’ll learn a lot that you didn’t know. About an hour into the Q&A, we opened it up to the audience and they came prepared and asked some great stuff. I’ve listed what I asked below so you can get a taste of some of the things the Russo’s talked about. 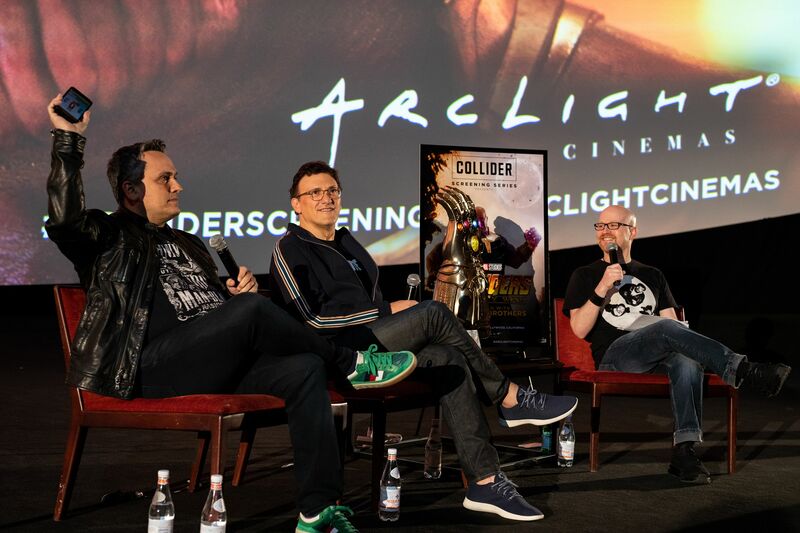 Finally, I have to give a HUGE thank you to Joe and Anthony Russo for sitting down with me for this epic event and extended Q&A. They’re beyond busy editing Avengers 4 and I know I speak for everyone that attended when I say they couldn’t have been nicer and more willing to talk about everything Infinity War. Check out what they had to say in the player above. Below are my questions. Let’s start off with the most important thing: how does Avengers 4 end? You got to visit the set of The Mandalorian. How did it look and how interested are you guys in helming a Star Wars movie? What TV show would you two love to guest direct? You mentioned after Avengers you were going to take a break from superhero movies. We all get that. But now that Disney is going to acquire Fox and get back Fantastic Four, Wolverine and X-Men, have you changed your mind? What do fans need to do to get you to helm a Wolverine and Spider-Man movie with Hugh Jackman? Originally you were going to film Avengers 3 and 4 at the same time. When did that change and why? What day of production were either of you like this is too much? I heard no actor had the full script and everyone was only given their scenes with fake scenes to go with it. Is that true? Is it true that the actors on set didn’t know when they were filming if they were filming a scene from Avengers 3 or 4? Did you ever come close to a completely different version of the movie or from the beginning of the writing process was it always this movie? When did you decide to open with the attack on the ship and where was Hulk when all the people were getting attacked? Was Thanos only able to beat Hulk because he had the Power Stone or is he just that powerful? What did you plus in the additional photography? Are there any Easter eggs that haven’t been found? Talk about how you landed the job on Avengers. Did you pitch Marvel on what you wanted to do? 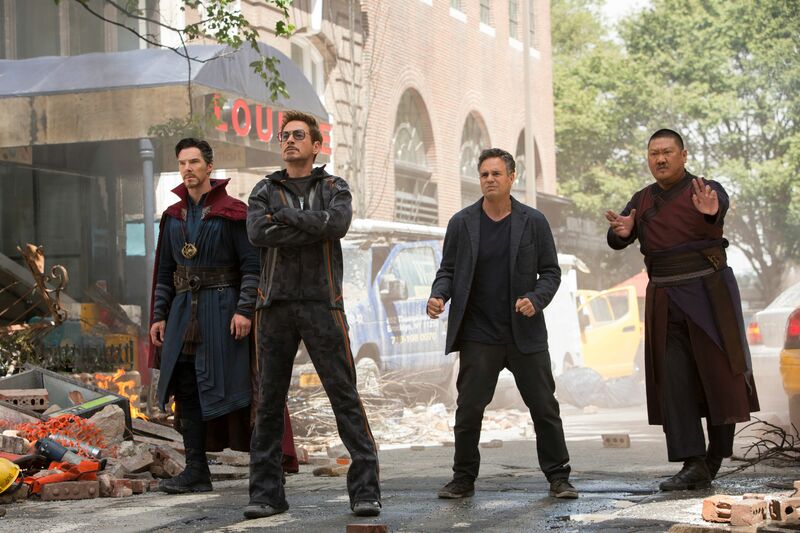 Was Kevin casually mentioning something like hey…so how would you feel about helming the Avengers? A lot of people don’t realize a lot of a movie is based around an actor’s availability. How did the massive cast for this film influence who got paired with who due to actor availability and did anything get shifted because an actor wasn’t going to be available when they needed to be there? Now that everyone has seen it, has someone said something about the movie on a message board or online and you guys are like yeah we missed that? Is Strombreaker more powerful than the Infinity Gauntlet? Who came up with Chris Pratt trying to imitate Thor’s voice? The movie has no wasted frames even with the extended run time. What is it like in the editing room and how did your work directing TV influence the editing process? How close did you come to releasing a longer version of the movie? Was it always your choice to have the red skull protecting the soul stone and how did he know all the rules? And why didn’t Hugo Weaving come back? What was the process of figuring out where the soul stone would be? Considering the hype surrounding it. Is there a possibility of Vision still being part of the Mind Stone since Shuri was unable to finish what she was doing? How close did it come to getting a Netflix Marvel character in the movie or was it never discussed? What do you think about the fan theory that Bruce is really Loki in disguise? How did the other Marvel filmmakers contribute to the story? Describe how an action scene in Infinity War gets put together? How much is scripted? How much is figured out in animatics and 2nd unit? While everyone is great I absolutely love Chris Hemsworth’s performance in the film. Can you talk about working with him and crafting that performance? What was it like filming Stan Lee’s cameos? Also, what has he meant to you as Marvel Studios directors? Does Thanos pay a physical price for using the fully powered Infinity Gauntlet? Was the film always going to end with Thanos smiling at the sunset? You shot both films in IMAX. How did that affect the shoot if at all? Who ruined the most takes and why?